← Could Aereo mean a boon for lawfirm business? 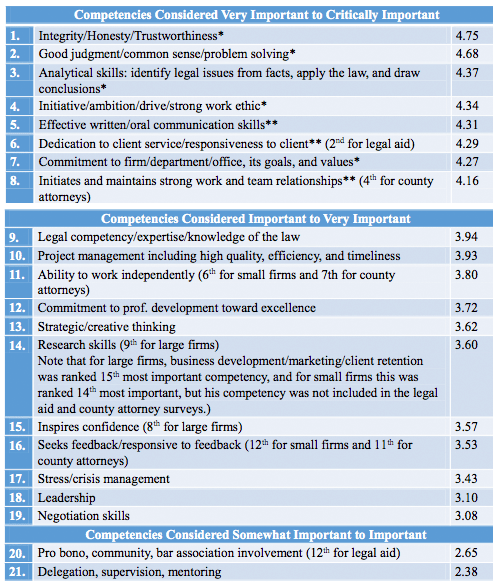 What Do Firms Look For When Hiring New Lawyers? I was forwarded this nice piec e written by Keith Lee, and it presents an interesting review of Neil Hamilton’s recent work on Legal Employers Hiring Practices. For some reason I am unable to share it, so I have copied it below, and here is a link to the article. 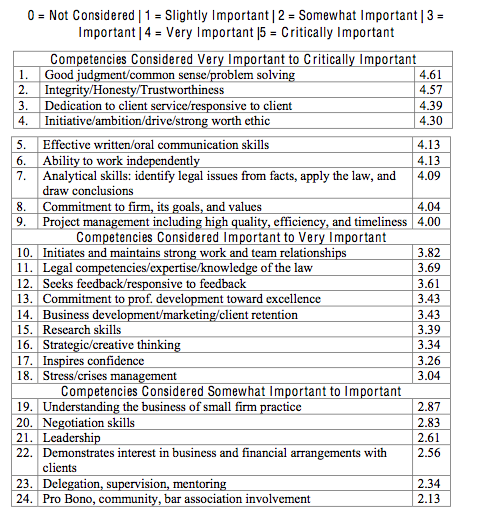 To guide legal educators and law students in responding to challenging markets both for entry-level employment and for applications to law schools, this article analyzes empirical research on the competencies that legal employers, the profession itself, and clients are looking for in a new lawyer. The article advances the proposition that law schools can build on an existing strength of helping each student develop knowledge of doctrinal law, legal analysis, legal research, legal writing and oral advocacy to do better at helping each student develop additional important competencies (and have evidence of those competencies) that legal employers, the profession, and clients and value, particularly the professional formation (professionalism) competencies. The article also helps each student understand the importance of developing transferable skills (or competencies) that equip the student to respond over a career to changing markets for legal services. An overall theme for both legal educators and law students is to view these changing markets as opportunities to grow in new directions and thus to differentiate from competitors. 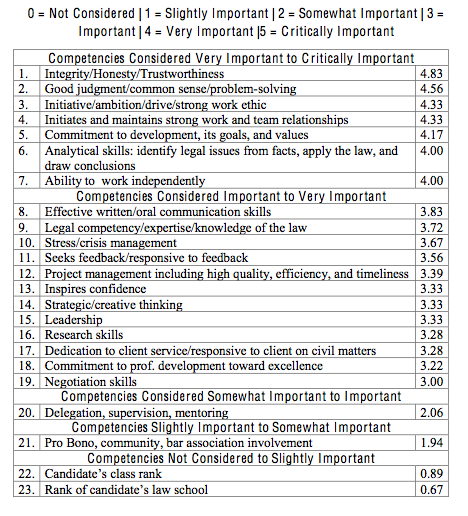 Translation: I surveyed a bunch of lawyers and asked them what they were looking for when hiring new associates. I also looked at surveys other people did on the same topic. This paper goes over what I found. I’m going to list out all of the survey data first, then offer brief commentary at the end. 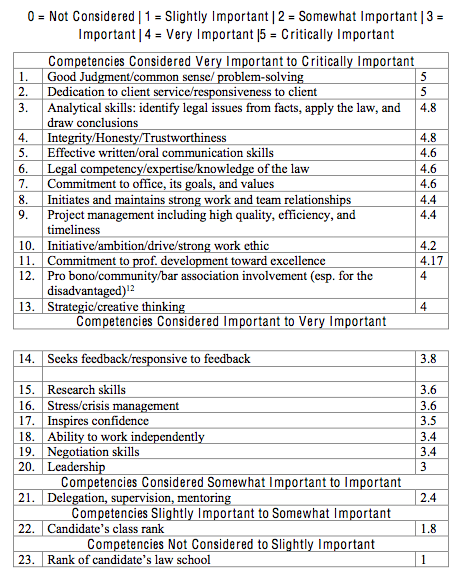 So this is what new lawyers think they need, which is different from what employers want. 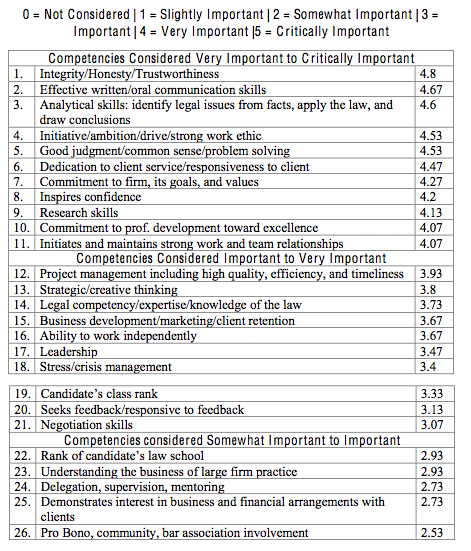 [Asked new lawyers to]…rate both the frequency with which each lawyer performed or used a competency and the lawyer’s perception of the severity of the consequences if the lawyer did not possess each competency. 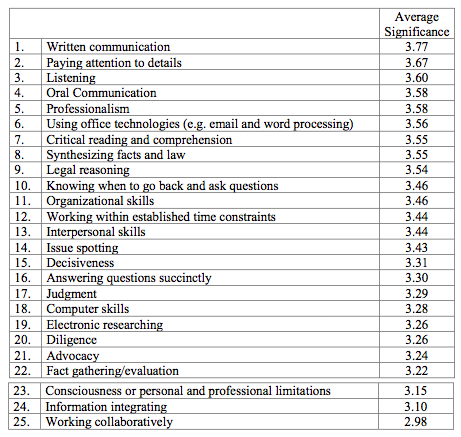 Respondents also rated the importance for associates of a list of seven knowledge bases and skills (with “1” being “not at all useful” and “5” being “extremely useful”). So is it really a wonder that so many practicing lawyers repeatedly talk about ethics? Big firm partners advocate for the same things. Judges and lawyers with over twenty years of experience all said the same thing when asked what is necessary to succeed as a new lawyer – integrity and relationships. It really always comes back around to trust. 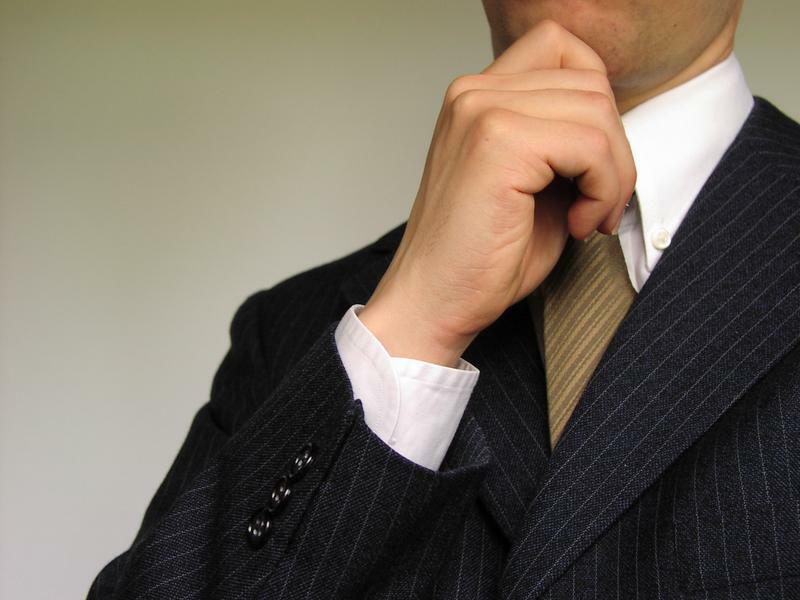 Just as clients want to know they can trust a lawyer when they retain them, firms want to know that they can trust the new lawyers they hire. There is no law school class for that. There is no experiential initiative that can cover that ground. Either you are a principled person, worthy of another’s trust, or you are not. Something to think on next time you are walking into an interview.